A few weeks ago my sister took me to a local chocolate shop. I had no idea how fun the afternoon was going to be. 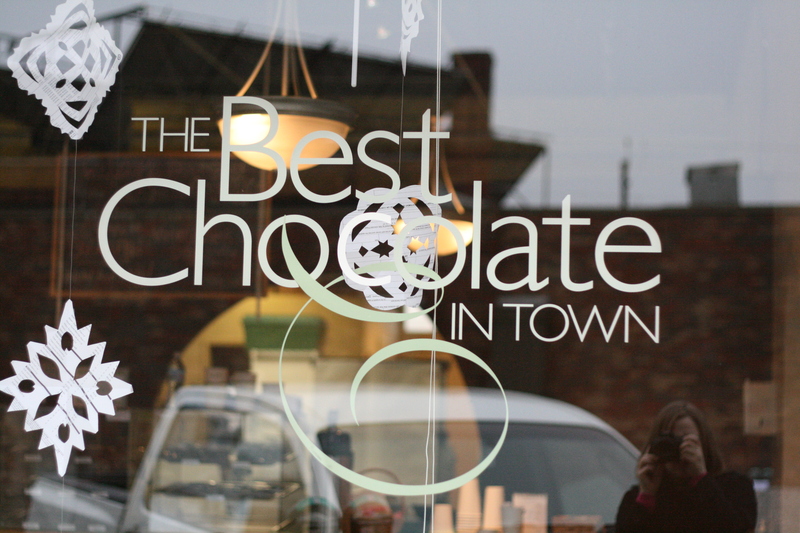 Stepping in the door of The Best Chocolate in Town (880 Massachusetts Avenue; Indpls.) we were greeted with row after row of handmade chocolate truffles in all sorts of exotic, as well as expected, flavors. In the room next door to the entrance we glimpsed the workings of the shop from behind glass. Chocolate slowly swirled in a large vat. Trays of newly made truffles sat on the counters and towards the back an employee stirred a concoction on a stove top. The owner, Elizabeth Garber, warmly greeted us and happily answered our questions. 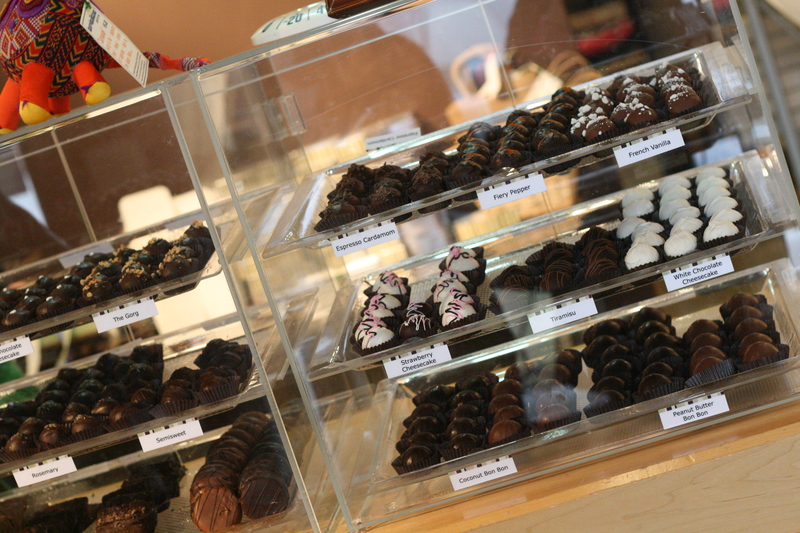 The shop has been around for 12 years and they make all of their own chocolates in-house, except for ice-cream and the extensive line of sugar-free chocolates they carry(which require a whole different process from regular chocolates). Once we'd looked at everything it was time to choose our truffles. Narrowing the decision down from 38 choices to only 6 truffles was very difficult. Some of the options included: Blackberry, Champagne, Cranberry Orange Cinnamon, French Vanilla, Guinness, Honey Lavender, Lemon Chiffon, Raspberry, Rosemary, Strawberry Cheesecake, and Sour Cherry. 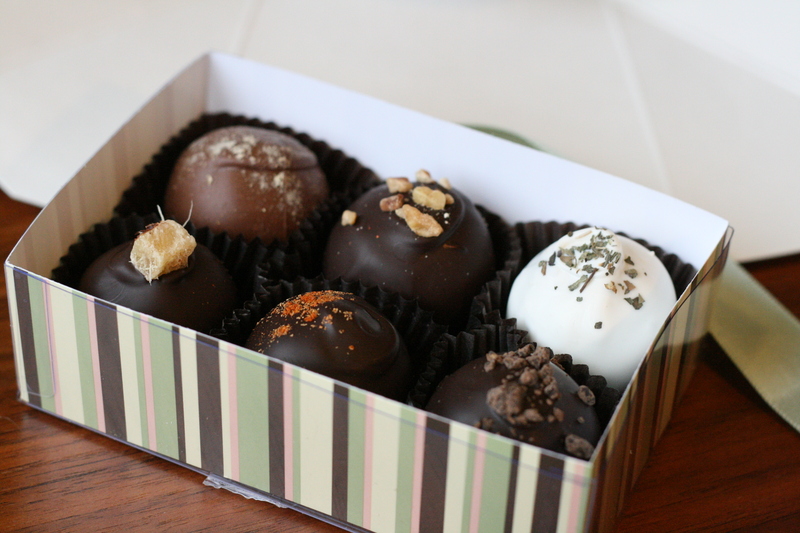 Looking back, we're not sure how it happened but we ended up with six very exotic truffles: The Gorg (Gorgonzola cheese), Cinnamon Basil, Wasabi Ginger, Espresso Cardamom, Fiery Cayenne, and Asian Spice (Five Spice). Our truffles were boxed up in an adorable box, complete with ribbon, and put in a bag tied with the shop's card and ribbon. We left trying to decide how many truffles we should try now and how many we should save. 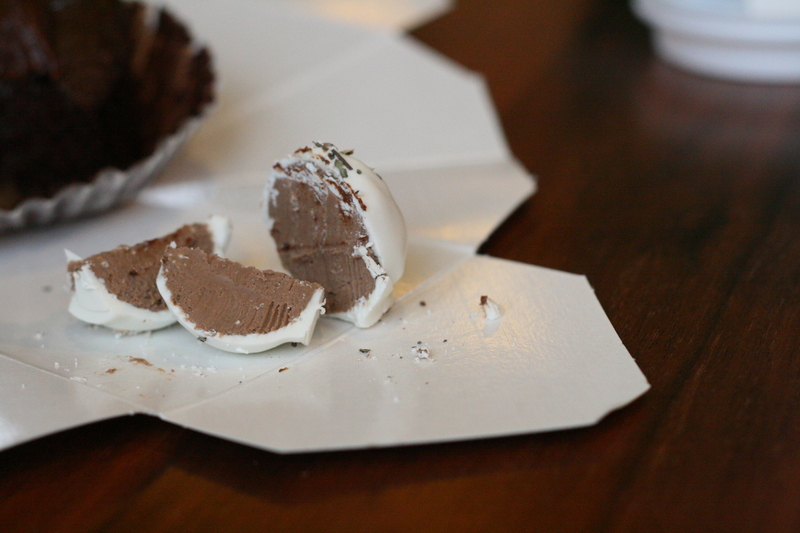 An hour later, coffee cups in hand and an additional taster added, we opened the box of truffles. First was The Gorg -- a creamy, slightly salty taste with a hint of Gorgonzola at the back of the mouth. We all agreed it was good. Ginger Wasabi next -- wow! I loved the hot tang in the midst of the chocolate, and the candied ginger on top. The other girls weren't so sure, but I insisted it was probably going to be my favorite. Everyone gave the Espresso Cardamon a thumbs up. Good chocolate flavor with just enough cardamom shining through. Excellent with chai, we decided. And then came Cinnamon Basil. Hmmm..... "It's like Bath & Body works landed on my tongue," said one taster. Much discussion ensued. None of us liked it -- but none of us like white chocolate and that is what the truffle is dipped in. But the truffle later redeemed itself when Alaina tasted it and declared it one of her favorites. With only two truffles left untouched it was unanimously decided that we had to go ahead and try all six truffles. What was the point in waiting until later? Fiery Cayenne was appealing because of the bite at the end and made it the favorite of one taster. Asian Spice was very creamy and not over powering. We all agreed that it too would be a perfect accompaniment to chai tea. By the time the afternoon ended we were satiated with coffee, chocolate, laughter and good company. I had no idea how fun it could be to consume a box of chocolates with friends! It was definitely one of the best ways to spend $12 and I highly recommend it! So, if any of you are in the Indianapolis area, you must check out The Best Chocolate in Town (especially if you are looking for a terrific Valentine's gift). And, if you aren't in the area, you can still look at their beautiful website and order online! I knew it! Nocturne is my favorite but my husband loves the Gorg. Also Espresso Cardamom is one of our favorites. ooooh, these pictures make me drool!!! A few days ago I would have been seriously annoyed that I didn't have any good chocolates in the house but then I received a beautifully wrapped and be-ribboned box of speciality French chocolates for my birthday. I'm no longer annoyed. My greedy chocolate craving has been fulfilled.. Being a dessert and candy maker, I always love trying great places and this has to be one of the best Indy has to offer for great chocolate treats!